Among the many high holy food holidays, Super Bowl Sunday has to be one of my favorites. Gameday eats are just super fun all around: focus on finger food, all the super health consciousness drops to the side and it’s all about big flavor! 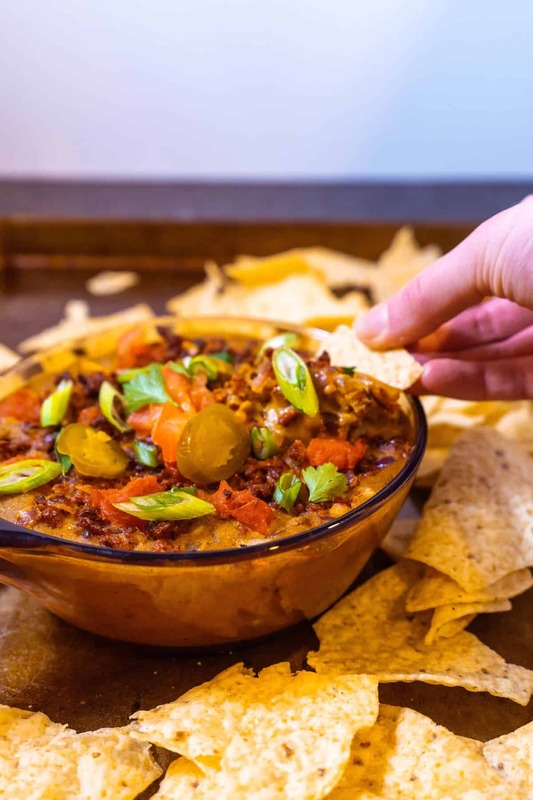 Which is why I’m SUPER pumped about this year’s brand new Superbowl MVP: Vegan Queso Fundido. Not only does it check all the boxes, but it’s actually sneakily just a little good for you too! Which means there’s lots of room for extra sliders/spinach dip/chicken wings too! … you know it’s all about the balance. Growing up, sports were never a big focus in our house. But we always watched the Super Bowl. We’d go skiing early that morning, then come home and make a big pot of chili with all the toppings and sit down together to watch the game (read: commercials and the Halftime Show). To this day, I’m still mostly in it for the food (this year it’s all about this Vegan Queso Fundido and my Rosemary Truffle Popcorn) and commercials. 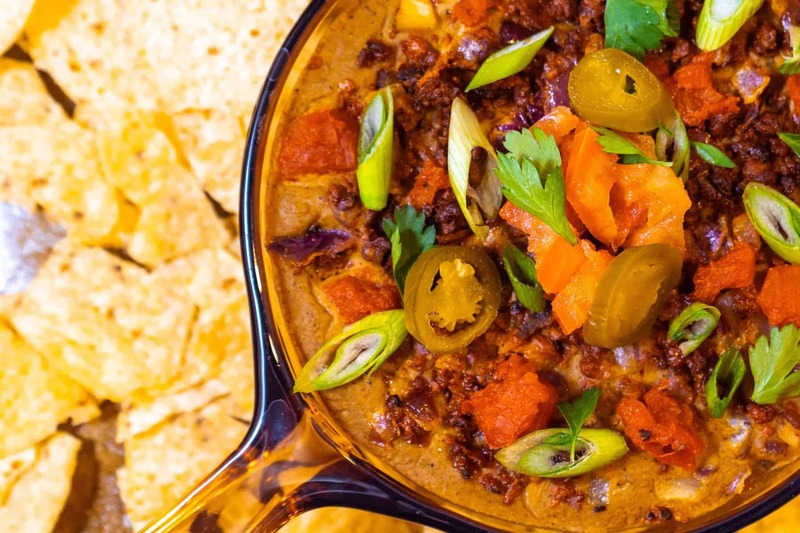 I’ve actually been dreaming about this Vegan Queso Fundido for years. 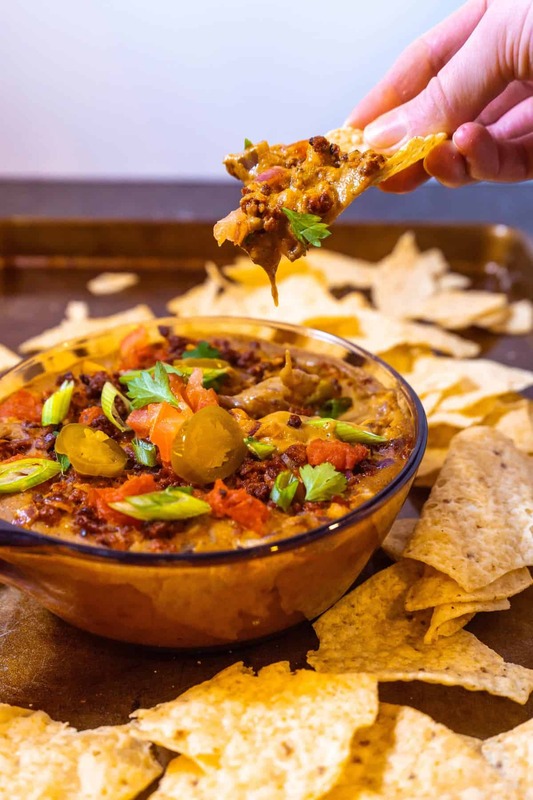 It’s a combination of my favorite soyrizo from Trader Joe’s and my riff on Minimalist Baker’s Vegan Cashew-less Queso Dip, which we’ve been obsessed with for years. People have NO idea that it’s made without any dairy! 1. Saute down the soyrizo crumbles and red onion. 2. Roast the eggplant and buzz together with almond milk and spices. 3. 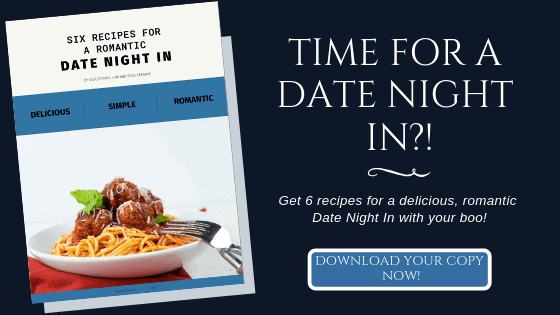 Combine in a mini skillet, broil and top with jalapenos, tomatoes and scallions! 4. Grab lots of chips for dipping! This is gonna go fast! Make this recipe for a few or double it and make in a full size skillet for a crowd. Don’t tell anyone it’s vegan and see what they say… I bet they’ll be totally blown away! Slice the eggplant into 1/2-inch thick rounds. Arrange the slices in a colander in the sick and sprinkle with salt. Let set for 20 minutes. Rinse with cool water and pat dry between two towels. Spray a sheet pan with olive oil spray and put the slices on the pan. Spray with olive oil spray and sprinkle with salt. Broil on high for 5 minutes. Flip, then broil on the other side for 5 minutes. Both sides should be golden brown. Remove from the oven and stack in a piece of foil and close. Let the eggplant steam for 15 minutes, then peel the skin. It should peel right off. Place the eggplant in a blender with the almond milk, nutritional yeast, garlic, cumin, chili powder, smoked paprika, cayenne, cornstarch and salt. Blend on high until smooth. Set aside. In a small saute pan over medium-high heat, crumble the soyrizo and cook for 5 minutes, stirring frequently. Remove the soyrizo to a bowl and add in the red onion. Cook for 3 minutes on high, then remove to the bowl with the soyrizo. Pour the queso from the blender into the saute pan and let thicken for about 5 minutes, stirring often. Remove from the heat. Stir the soyrizo and onion back into the queso and pour into a small oven-safe skillet. Place under the broiler for 4-5 minutes, then top with diced tomatoes, scallions and/or jalapenos, grab a handful of tortilla chips and dig in!